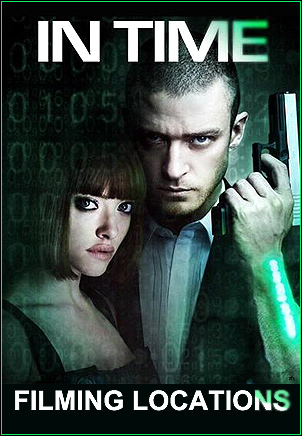 "In Time" is set in an alternate world where time is literally money. those minutes to others (via an ATM-like device implanted in their arms). Citizens stop aging at 25. In theory, they can live forever, eternally young - but only as long as they can earn more time to keep their time-meters running. When time runs out, when their meter hits zero (the equivalent of becoming bankrupt today), they die. The poor lead a desperate life, paycheck to paycheck, barely able to stay alive, while the rich live in isolated luxury, with huge surpluses of time. - walking through the garish ghetto. The first shot is looking down on the street at Will exiting the hotel. on the east side of downtown Los Angeles, just east of the L.A. River. filled with mostly empty buildings & warehouses. streets across the river), and created the neighborhood of Dayton. for the movie, and quite a few fake signs were added, as well. The fictional "Florence Hotel", seen in the screencap above, is at 611 Anderson Street. just a few steps south of the door where Will exited. towards the 6th Street / Whittier Blvd Bridge (seen at the end of the street). 0:04:19: Will checks the time as he crosses an intersection, with a green building behind him. The green building's main sign reads "Mission", and its smaller sign reads "Out of Time". In the movie, this part of "Dayton" is called is "Pedre Plaza". In reality, this is the intersection of Jesse Street & Anderson Street. The green building is at the northeast corner, at 654 S. Anderson Street. 0:04:22: Realizing that he's late, he speeds up, running the rest of the way to work. As he does, he passes a building with a sign reading "99-Seconds Only Store". That building is at 2155 E. 7th Street, at the SW corner of Jesse St & S. Myers St. The camera is looking west / SW, and he is running west, past the building's north side. In the real world, this is located a long way from downtown L.A. It's the Pasadena Power Plant, at 82 E. Glenarm Street, in Pasadena, CA. It's located at the very end of the Pasadena (110) freeway, next to the railroad tracks. who points out a rich man who is buying drinks and has a century of time on his arm. He is clearly out of place in this part of the world, and obviously at risk. Will warns the man that he will be robbed & killed, but the guy seems unconcerned. located on the NW corner of 7th Street & Santa Fe, in downtown L.A.
a dive bar in the movie "Horrible Bosses", "House of Lies", and may other productions. and they flee out the back door of the bar. 0:09:32: We see them running away, with two bridges in the background. This was shot looking north up Mesquit Street, just north of 7th Street, in downtown. The first bridge is the 6th Street Bridge. The second bridge is the 4th Street bridge. They are running south down Mesquit, on the west side of the L.A. River. 0:09:50: They eventually escape when Will breaks into a warehouse, where they hide. between 7th & 8th (on the north & south) -- part of the old Produce Mart. all of his time (money) to him -- the equivalent of millions of dollars. time-meter runs down to zero, and his dead body topples off the bridge. (spanning the L.A. River), and is facing north.